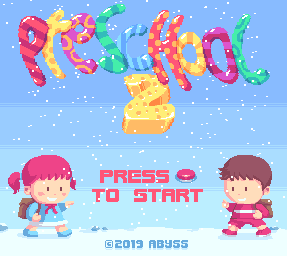 Preschool #2 is out. 48kb full of synthetic sugar. Nice tunes and neat design. Love the music and the presentation! Awesome! oh noez! the awesome is back! It warms my heart to see an 2010s OCS production with so much effort and love put in every detail. Others just chucking in random colours and badly aliased graphics, take note. Great tunes, excellent gfx & design, simply love it. Sweet gfx and great tunes. Many sweet tracks in here. Wow, you listen quite closely :) Thanks! my fav part was: seamless atmosphere change in Rewind, and slight modulation in on and on before transpose. Cute one + fresh gfx. Really nice stuff. Gorgeous minimal design, graphics and music. First product that's grabbed my attention in years! Nice design and superb music. First and last song in track list are best - my favorites. Hey Pink ! Great tunes, and it's awesome that you are still targeting the A500 (the _best_ Amiga!). I remember talking to you when you were still living in a student home, back in 1994 =) time flies! "On and on" is amazing! page created in 0.020748 seconds with 15 queries.